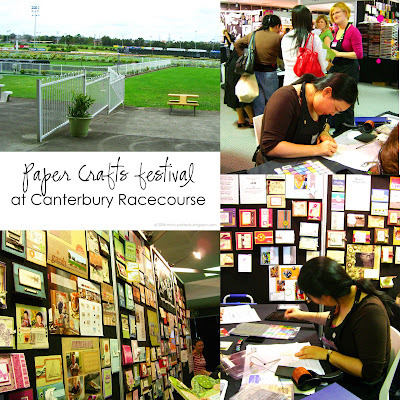 Here is the craft and cards part of last weekend, when we visited the Sydney Paper Crafts Festival, held at Canterbury Racecourse. Obviously, all the horses were resting up for the Melbourne Cup, so the track was deserted. Not so inside the function centre where the usual crowd of ladies and their fed up men were milling around the paper crafting stalls. This was a smaller fair than, say, the craft fair at Darling Harbour, which was a good thing, since I only had limited time to visit all the stalls before getting back on the bus to the Zumbo café. I also wanted to see my friend Lin Mei, who doing demos was at the Stampin’ Up! stand. The SU! stand was the most enticing, with the demonstrators’ creations adorning the wall. It looked really good. LM also did a great job showing off her wonderful stamping and colouring skills. 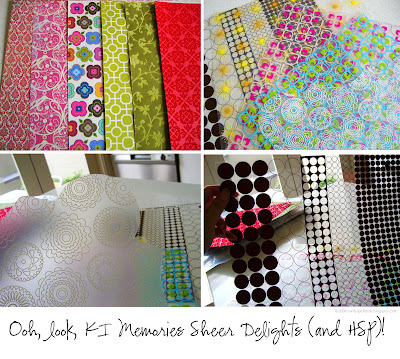 My highlight was finding some of the new KI Memories Sheer Delights transparencies, which are semi-opaque thick plastic sheets in modern prints with die cut edges. They are lovely enough to use as placemats. I think I should have bought more. I also got some Doodlebug Designs flocked paper (red design in the photo) which will work well on Christmas cards, and a Hambly Screen Print transparency. And then we topped it off with hot chocolate and dessert at Zumbo. What more could I ask for? (Maybe a win in the office Cup sweep, but that was not to be). The papers in the bottom two pictures are gorgeous! Love the die cut stuff. What are you going to do with them? How exciting!